Everyone loves a home cooked meal but cooking that meal has a side effect that nobody enjoys – a dirty cooker! 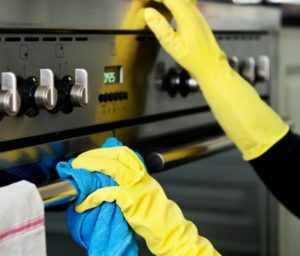 Here are some tips on not only how to clean your cooker but some preventative ways to keep it from getting too dirty to start with. Strip it down – Some of the dirtiest areas on your cooker top are behind the temperature knobs and around the burners. Remove the burner grates and control knobs. Soaking them in the filled with hot soapy water will help loosen any dirt, grease and grime. Clean the fuel ports with a paper clip (make sure that you have taken proper precautions on disconnecting the cooker before you begin cleaning). If your cooker is electric, you can soak the knobs and drip pans but do not put the burners in water as they are self-cleaning and should only be removed (some unplug while others are not removable) in order to clean under and around them. Spray it down – Using a cleaner that is recommended for your cooker, spray down the top of your cooker to help remove the grease and grime. Carefully scrub any stubborn stains with a non-abrasive sponge. Wipe down the entire cooker with a damp rag and polish with a lint-free towel to add a shine to your now degreased cooker. Caution: Do not spray the elements themselves with any solutions, just wipe with a hot, soapy cloth. Replace knobs and grates – After the knobs and grates have soaked for an hour or so, scrub them with a non-abrasive sponge to remove all gunk. Soak longer or use ammonia if the grates require additional care. After the grease and grime is removed, rinse in hot water and dry until shiny with a lint-free rag or towel. The self-cleaning feature on some ovens is very handy. Not only do some reach temperatures as high as 900 degrees Fahrenheit, they take away the need for a lot of elbow grease. Unfortunately, this feature is not available on all cooker ovens and it uses a lot of energy. Here are some steps you can take to clean your oven by hand. Spray i t down – Wipe all loose crumbs out of the oven before starting. Next, spray the entire interior surface of your oven with a cleaner recommended for your cooker. As always, first test a small area to make sure the method you use won’t cause any damage. Let it sit according to the chemical directions or a little longer for stubborn stains. Using a scraper, sponge and scouring pad if needed, remove all the built-up gunk from your oven. Wipe interior with a soapy rag and then with a clean wet rag. Finally, dry the interior with a lint-free rag. 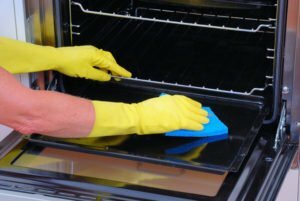 Natural cleaners – If your oven is not overly dirty, you can try some natural solutions to clean your oven. It’s easy to make non-toxic oven cleaners with natural household items such as vinegar, lemon juice and baking soda. Best of all, you save money while not subjecting yourself to harm chemicals with harsh odours. Racks – Clean the removed racks with an approved cleaner and a sponge before returning to the oven. Wipe the glass window – To remove the nasty film that covers your oven door, you can use most oven cleaners, glass cleaner (if the window is not too greasy) or a solution that you make yourself. One homemade solution that works is to make a paste with baking soda and water. Spread it over the glass and let it sit for about a half hour. Wipe clean with a wet rag and dry with a lint-free cloth. 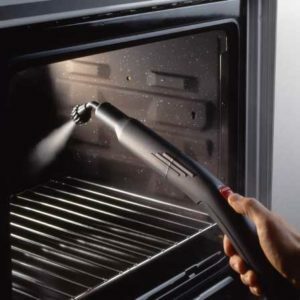 Oven door –Cleaning the outside of the oven is easy most of the time. Because of the low exposure to direct food, you can use the same cleaner as you used on the cooker top and wipe clean and dry. Clean the outside window as directed above and dry with a lint-free cloth for a finished look. The hood vent has a very important job in your kitchen – it removes smoke and grease from the air caused by cooking. Unfortunately, this can leave stains and clog your vents over time. Cleaning the hood and filters is key to keeping things running smoothly. Wipe it down – Using soapy water, wipe the hood with a soft cloth. Once all grime is removed and soap is removed, dry with a lint-free cloth. Polish stainless steel – Many homes features appliances in the popular finish of stainless steel. If your hood has this finish, it is important to polish it after you have cleaned it. With a dry microfiber cloth, polish the hood in the direction of the grain. Clean the filters – Remove the hood filters and soak in hot soapy water for about 20 minutes. With a nylon brush, scrub to remove all grime. Rinse in hot water and then dry. Replace the filter in the hood before using the hood. The easiest way to clean your cooker, is to prevent all messes you can. Here are a few easy tips to help you keep things neat between deep cleanings. An easy step to take is to place foil or a cookie sheet on the bottom of your oven when baking. Wipe stains, spills and splatters as they occur. Fresh spills are easier to remove while the cooker is warm and the stain has not had time to set. If a spill occurs during baking, pour table salt on the spill. Once the oven cools, the clean-up will be much easier. Place casserole dishes on top of cookie sheets before baking. If the casserole boils over, any spillage will bake onto the cookie sheet and not your oven. With a few preventative measures and these deep cleaning tips, your cooker and area will be in tip-top shape in no time.